The Yongala Shipwreck [The Great Barrier Reef, Australia] Australia’s Great Barrier Reef is probably the most popular diving site in the world, and one of the most famous diving sites here is the S.S. Yongala wreck. 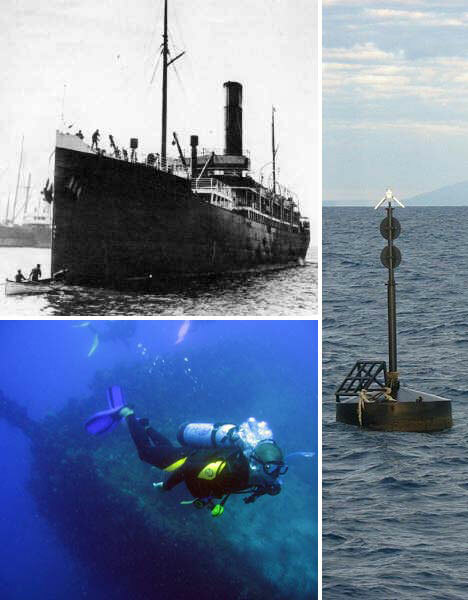 The Yongala sank in a cyclone about 100 years ago taking the lives of all on-board – 121 people in all. Even after being submerged for so long, the Yongala is surprisingly well-preserved at its final resting place about 60 kilometers from Townsville in about 30 meters of water. The exact location is marked with a buoy. 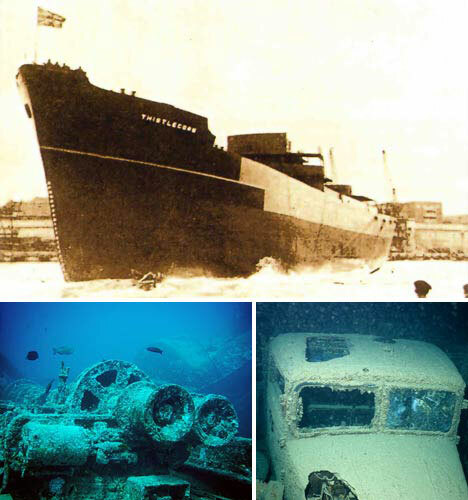 S.S. Thistlegorm [Red Sea] The S.S. Thistlegorm was a British Merchant Navy ship that was sunk by a German bomb in 1941 as it carried guns, bombs, and ammunition on its way to Alexandria. The wreck was discovered by Jacques Cousteau in 1956 and has since become one of the most popular dive sites in the world. The wreck is located about 30 meters beneath the surface of the Red Sea just off the coast of the Egyptian Sinai Peninsula. Divers can explore the the locomotives that were onboard at the time the Thistlegorm sank, the well-preserved guns and torpedos, various military vehicles that were being transported, and the location where the two 1,000 lb. German bombs hit the ship and led to its demise. 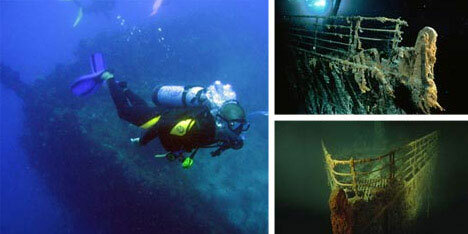 The ‘Black Swan’ Dive Site [Off the coast of Portugal] The so-called ‘Black Swan’ project involves the largest treasure ever discovered at sea. A Florida-based company by the name of Odyssey Marine Exploration is a group of modern-day treasure hunters, and they discovered the richest shipwreck ever found off the coast of Portugal in the Atlantic. Odyssey has been highly secretive about the exact location and the name of the shipwreck since they discovered it a few years back. 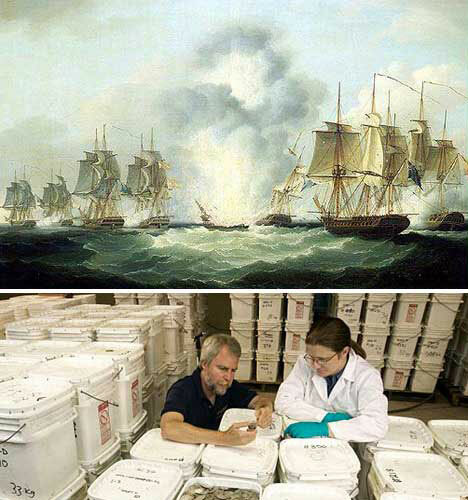 So far, they’ve recovered 500,000 gold and silver coins worth approximately $254 million! The government of Spain believes that this lost ship is the Nuestra Senora de las Mercedes, which was sunk by British war ships in 1804 along with 200 crew members. A historical account of the Mercedes says that there were 4,436,519 gold and silver pesos on-board at the time of its demise. This wreck led to Spain declaring war on Great Britain. Spain is now trying to get a piece of the lost treasure which they claim should be in a museum, but Odyssey most likely will be able to keep the majority of the gold and silver found at this amazing shipwreck. The Titanic [North Atlantic Ocean] The Titanic is by far the most famous shipwreck of all time, which is in large part due to the popular movie released in the late 1990s. The Titanic set off on her maiden voyage in April of 1912 with 2,227 passengers and crew, and a few days later struck an iceberg then sank about 350 miles southeast of Newfoundland, Canada. In the wreck, 1,522 people were lost at sea. 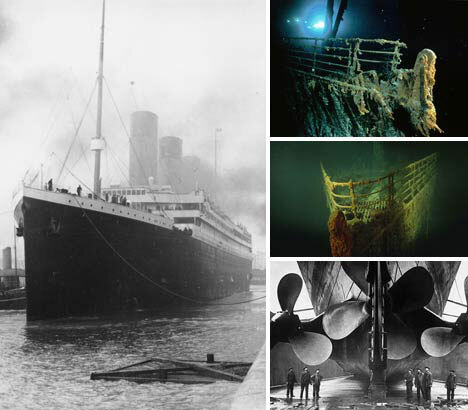 The Titanic wreck was discovered in 1985 approximately 12,500 feet below the surface of the North Atlantic. The wreck has been photographed by underwater remotely operated vehicles; it’s far too deep for scuba divers to dive here. The mystique surrounding the legacy of the Titanic will live on forever as people continue to be fascinated by this tragic shipwreck. Pearl Harbor Fleet of Ships [Hawaii] The famous attack on a U.S. Navy base at Pearl Harbor claimed the lives of about 2,400 people and sparked the start of World War II for the United States. Over 300 planes bombed the harbor area in a surprise attack in 1941, and as you would expect, the wreckage was immense. The Pearl Harbor attack wrecked five large Navy battleships, one minelayer, two destroyers, and damaged countless other Navy vessels and aircraft. 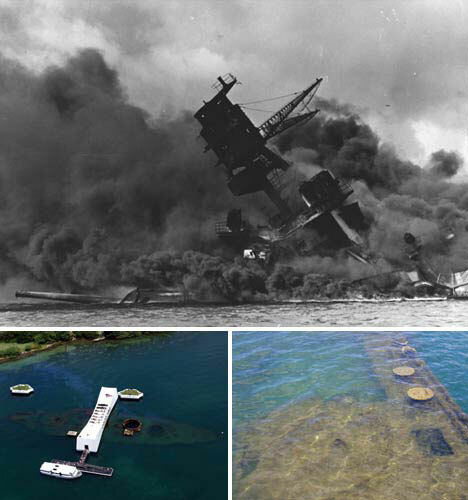 The most famous wreck at Pearl Harbor is the USS Arizona. Today, a memorial stands at the site of the Arizona shipwreck where visitors can view the wreckage from a glass floor building built above the site. The RMS Lusitania [Queenstown, Ireland] This gigantic ocean liner left New York City enroute to Liverpool on May 1, 1915 with nearly 2,000 passengers onboard. Despite warnings of German U-boats in the area, captain William Turner pressed on hoping to avoid their threat and arrive safely in England. 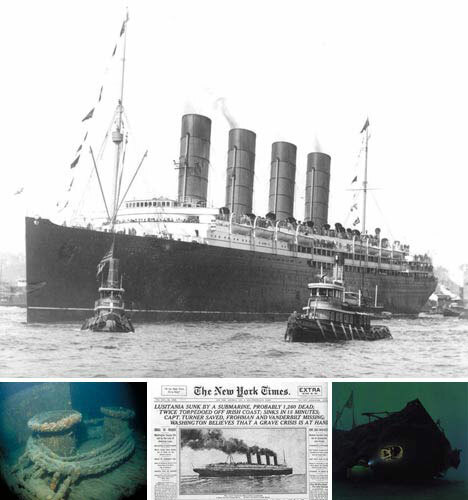 However, the Lusitania wasn’t so lucky. It was struck by a German torpedo and consequently sank within 18 minutes of being hit. The 785 foot long, 31,550 ton ship went down along with 1,195 passengers. The wreck now lies in about 295 feet of water and stands as a mass graveyard to all who lost their lives that cold, foggy night.